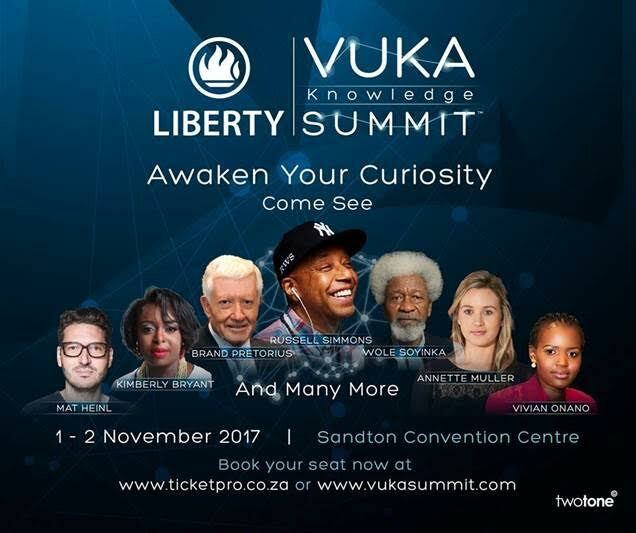 The countdown to the Liberty Vuka Knowledge Summit officially begins with Russell Simmons, US mogul, being announced as the key note speaker. The summit will take place on 1st and 2nd November 2017 at the Sandton Convention Centre, and promises to be the ultimate thought leadership experience for forward-looking people. The summit is anchored by the theme: Awaken Your Curiosity. Some of the world’s leading entrepreneurs, business leaders and intellectuals – including Nobel Prize winner Wole Soyinka and founder of online platform Flexy, Annette Muller will be imparting their insights about how their curiosity, as well as thirst for, and application of, knowledge has led to their success in business and society. The Liberty Vuka Knowledge Summit founder Carlo Murison believes the curious will be inspired and led to an awakening. Liberty's Divisional Director of Brand and Marketing, Thembeka Saleshando, says: "Liberty is excited to be partnering with some of the world's leading futurists, innovators and business leaders to inspire and awaken society's desire for knowledge and success. Even in our 60th year of existence, we understand the power of being able to harness knowledge to impact the world we live in, because knowledge on its own is useless, unless it can be applied to change people’s realities. The summit aligns perfectly with our purpose of enabling financial freedom, which we are able to fulfil by putting knowledge into action". The summit hopes to attract an audience of business leaders and aspirational change makers, and it is therefore fitting that Talk Radio 702's Azania Mosaka and CNBC Africa's Timothy Maurice Webster will partner as hosts to connect this audience with some of the best minds on the global stage. The Liberty Vuka Knowledge Summit is an enlightening thought leadership experience for forward-looking people. The 2017 summit is the inaugural edition and it offers some of the most dynamic minds in contemporary society who will share their insights. It is a platform to inspire those who are curious and want to power-up their game plans in their personal journeys - to get ahead in their careers, in their businesses, in their organisations and in their lives. General Tickets are R3950 per day and VIP Tickets are R6800 per day. Tickets are on sale at www.ticketpro.co.za. More information is available at www.vukasummit.co.za.